Microbial assemblages on host plants and animals are an increasingly recognized biological phenomenon. We present evidence that microbes in association with mussels and seaweeds are contributing greatly to nitrogen cycling in coastal marine areas, often many times that of the microbes that are simply free-living in seawater. 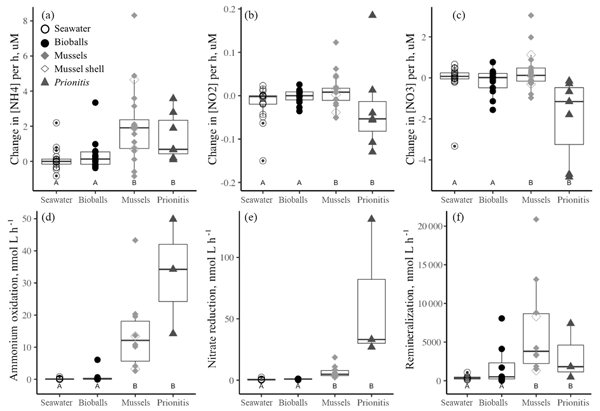 The addition of dissolved organic carbon increased nutrient uptake by microbes, suggesting that coastal species enhance microbial metabolism through resource provisioning. The surface albedo time series CLARA-A2 SAL was used to study trends in the timing of the melting season of snow and preceding albedo value in Finland during 1982–2016 to assess climate change. The results were in line with operational snow depth data, JSBACH land ecosystem model, SYKE fractional snow cover and greening-up data. In the north a clear trend to earlier snowmelt onset, increasing melting season length, and decrease in pre-melt albedo (related to increased stem volume) was observed. Global forest resources are accounted for to establish their potential to sink carbon in woody biomass. 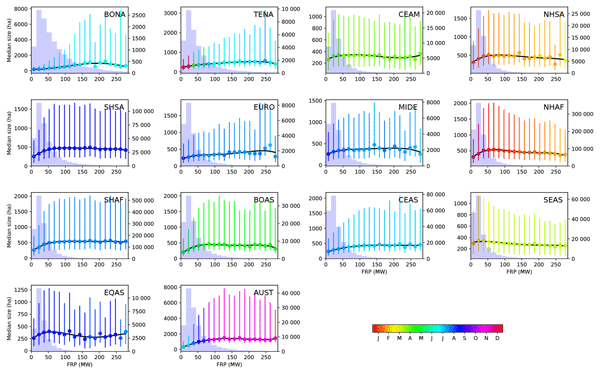 Climate prediction models realize the effects of future global forest utilization rates, defined by population demand and its evolution over time. However, forest management approaches consider the supply side to realize a sustainable forest carbon stock and adapt the harvest rates to novel climate conditions. 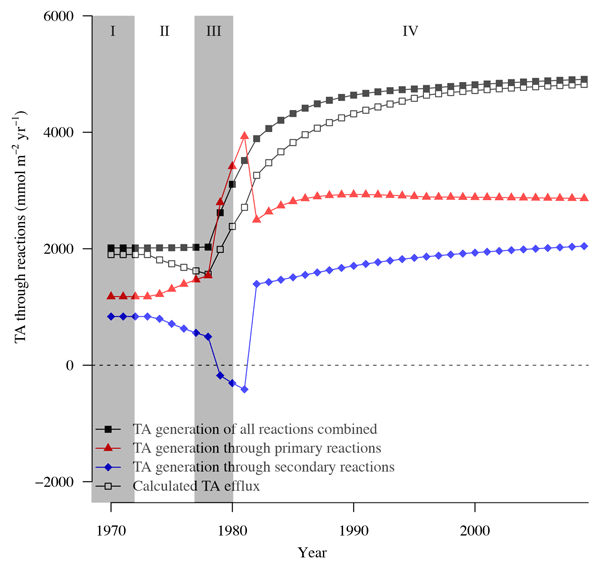 This study simulates such an adaptive sustained yield approach. We analysed ecosystem-scale measurements of methane exchange between Arctic tundra and the atmosphere, taking into account the large variations in vegetation and soil properties. 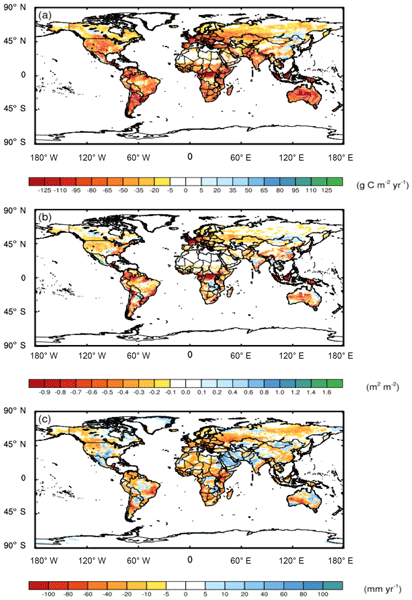 The measurements are spatial averages, but using meteorological and statistical modelling techniques we could estimate methane emissions for different land cover types and quantify how well the measurements correspond to the spatial variability. This provides a more accurate estimate of the regional methane emission. Fire propagation and fire size are usually considered to be proportional to fire intensity. We used a global database of fire patch size and fire radiative power, used as a proxy of fire intensity, to test this relationship at a global scale. We showed that in some regions fire size tends to saturate when a regional fire intensity threshold is reached. We concluded that increasing landscape fragmentation limits fire propagation and this effect should be accounted for in global fire modules. The study focused on understanding C biogeochemistry of two adjacently located estuaries undergoing different levels of anthropogenic stresses. 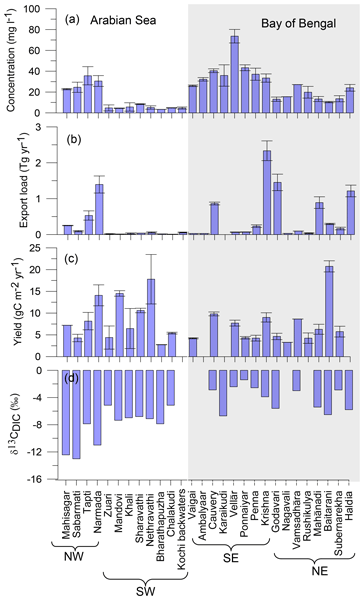 Different parameters related to C cycling were measured in an anthropogenically influenced and a mangrove-dominated estuary. Although the entire estuarine system acted as a source of carbon dioxide to the regional atmosphere, emission approximately 17 times higher was noticed from the anthropogenically affected estuary compared to mangrove-dominated one. Oceanographers try to understand the ocean’s role in the global carbon cycle. Trace levels of natural radionuclides can inform this connection and their half-lives provide an estimate of the timing of processes. We used the 210Po and 210Pb pair to examine the export of carbon from the surface ocean to depth along the GEOVIDE GEOTRACES cruise track. We found that the flux was regionally variable, that upwelling was an important regional factor, and that both large and small particles drove flux. 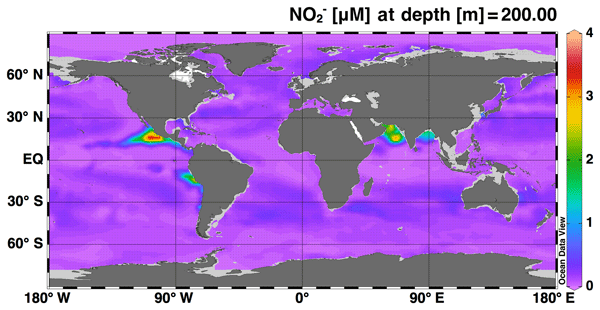 Nitrite is a key intermediate in many nitrogen (N) cycling processes in the ocean, particularly in areas with low oxygen that are hotspots for N loss. We have created a 3-D global N cycle model with nitrite as a tracer. Stable isotopes of N are also included in the model and we are able to model the isotope fractionation associated with each N cycling process. Our model accurately represents N concentrations and isotope distributions in the ocean. 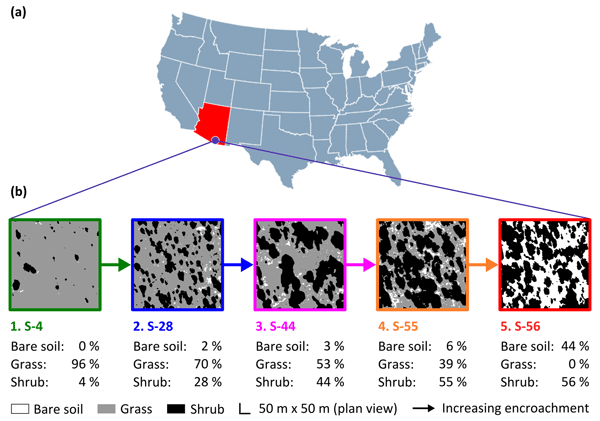 Increasing shrub cover promotes land degradation in semi-arid grasslands and has the potential to impact the soil nitrogen pool, which is essential to primary production. Our study showed that increasing shrub cover concentrates soil nitrogen into localised patches beneath shrub canopies. Further, we determined that increasing shrub cover inhibits inputs of nitrogen by the soil microbial community. Thus, we conclude this phenomenon can perturb nitrogen cycling in these ecosystems. 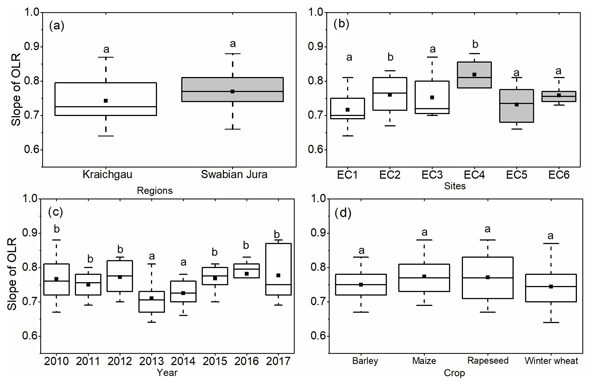 This study utilized state-of-the-art measurements of nitrogen isotopes to evaluate nitrogen cycling and to assess the biological sources of the potent greenhouse gas, N2O, in response to water-saving practices in rice systems. 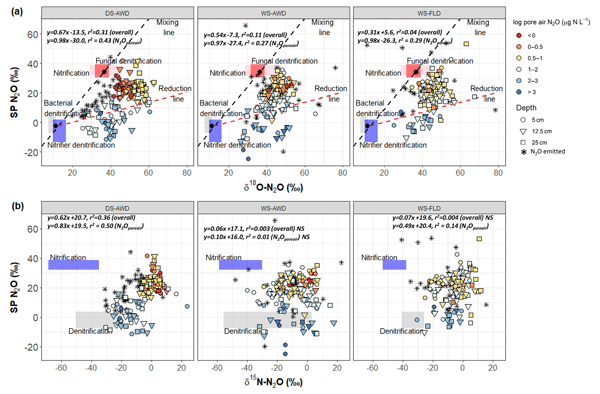 Water-saving practices did emit more N2O, and high N2O production had a lower 15N isotope signature. Modeling and visual interpretation indicate that these emissions mostly came from denitrification or nitrifier denitrification, controlled upstream by nitrification rates. Carbon stored in coastal wetlands is of global relevance to climate regulation, but broadscale inventories of this "blue carbon" are lacking. Sampling salt marshes in the UK, we developed a predictive tool with the capacity to predict up to 44 % of spatial variation in soil carbon from simple observations of plant community and soil type. 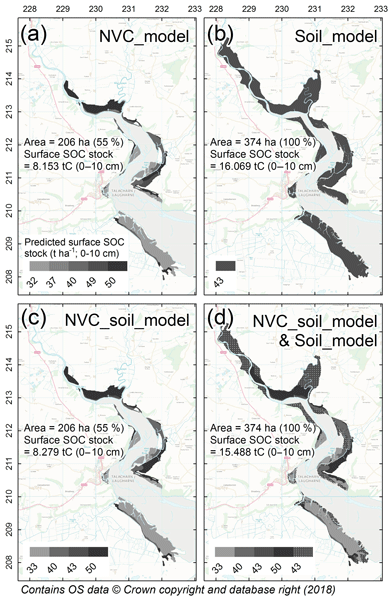 Marsh-specific maps of soil carbon were also produced, demonstrating the application of this easy-to-use tool for landscape-scale predictions of blue carbon. This work highlights that iron (Fe) dynamics plays a key role in the release of alkalinity from sediments, as exemplified for the Baltic Sea. 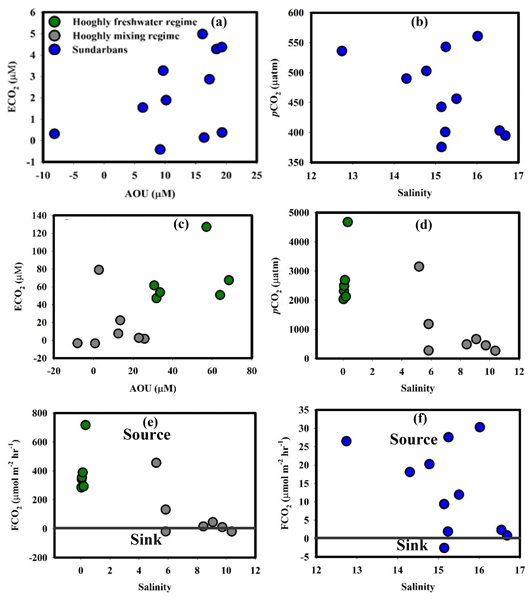 It furthermore demonstrates that burial of Fe sulfides should be included in alkalinity budgets of low-oxygen basins. The sedimentary alkalinity generation may undergo large changes depending on both organic matter loads and oxygen conditions. Enhanced release of alkalinity from the seafloor can increase the CO2 storage capacity of seawater. 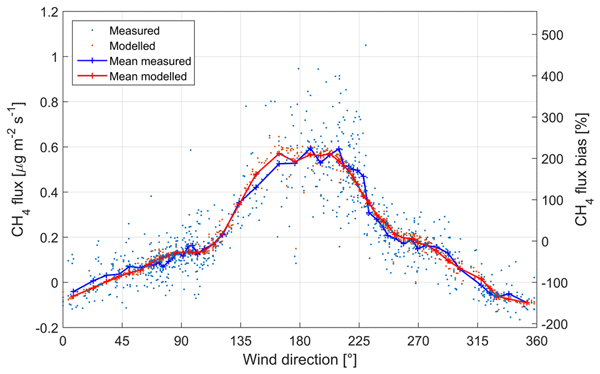 Terrestrial biosphere models that simulate both leaf dynamics and canopy photosynthesis are required to understand vegetation–climate interactions. 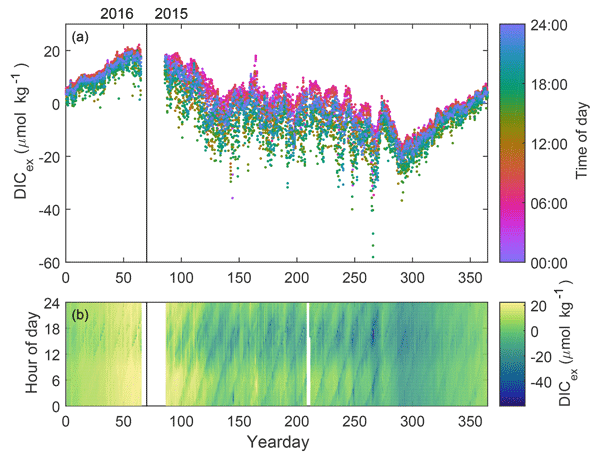 A time-stepping scheme is proposed to simulate leaf area index, phenology, and gross primary production via climate variables. 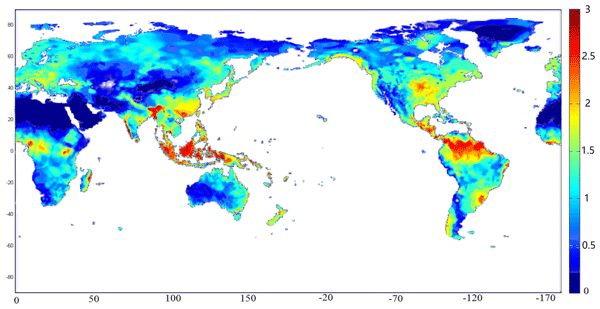 The method performs well on simulating deciduous broadleaf forests across the eastern United States; it provides a simplified and improved version of the growing production day model for use in land surface modeling. Data obtained from sediment trap experiments in the Indian Ocean indicate that lithogenic matter ballast increases organic carbon flux rates on average by 45 % and by up to 62 % at trap locations in the river-influenced regions of the Indian Ocean. 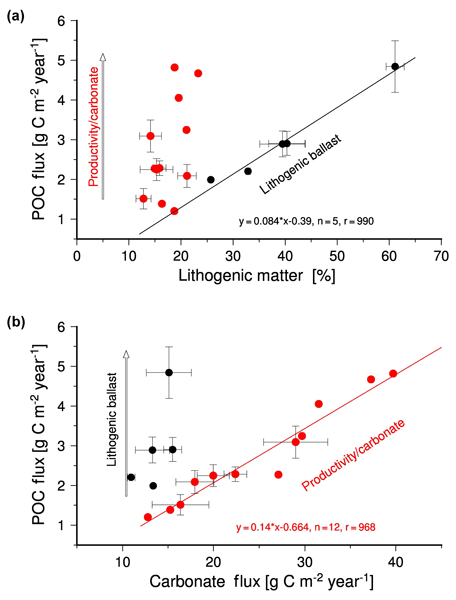 Such a strong lithogenic matter ballast effect implies that land use changes and the associated enhanced transport of lithogenic matter may significantly affect the CO2 uptake of the organic carbon pump in the receiving ocean areas. An order-of-magnitude variability in DIC was found within the Indian estuaries due to significant variability in size of rivers, precipitation pattern and lithology in the catchments. Indian monsoonal estuaries annually export ∼ 10.3 Tg of DIC to the northern Indian Ocean, of which 75 &percnt; enters into the Bay of Bengal. Our results indicated that chemical weathering of carbonate and silicate minerals by soil CO2 is the major source of DIC in the Indian monsoonal rivers. We compared the energy balance closure (EBC) under varying environmental conditions and investigated a wide range of possible reasons for the energy imbalance. As measures for the imbalance, we used ordinary linear regression, the energy balance ratio (EBR), and the energy residual. The EBR was also investigated as a function of buoyancy, friction velocity, and atmospheric stability. Moreover, the relationship between the EBC and flux source area or footprint was also investigated. 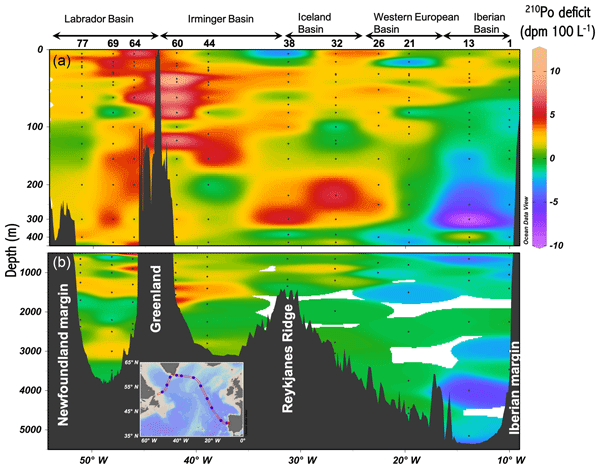 Processes governing CH4 dynamics have been scarcely studied in southern hemispheric bogs. 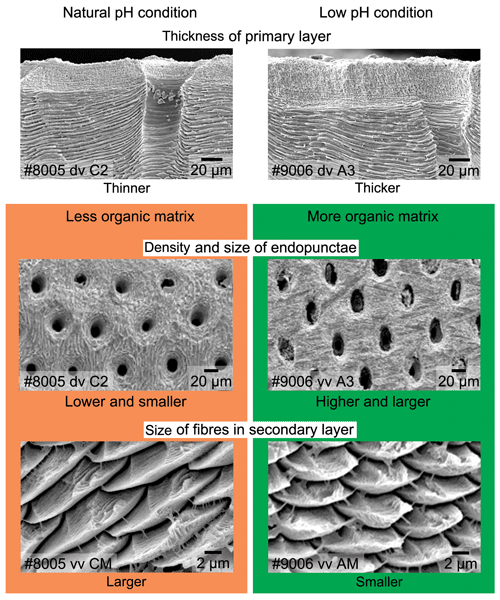 These can be dominated by cushion-forming plants with deep and dense roots suppressing emissions. Here we demonstrate how the spatial distribution of root activity drives a pronounced pattern of CH4 emissions, likewise also possible in densely rooted northern bogs. We conclude that presence of cushion vegetation as a proxy for negligible CH4 emissions from cushion bogs needs to be interpreted with caution. Most previous studies concerning the effects of environmental changes on marine organisms have been carried out under photosynthetically active radiation only conditions, with solar ultraviolet radiation (UVR) not being considered. 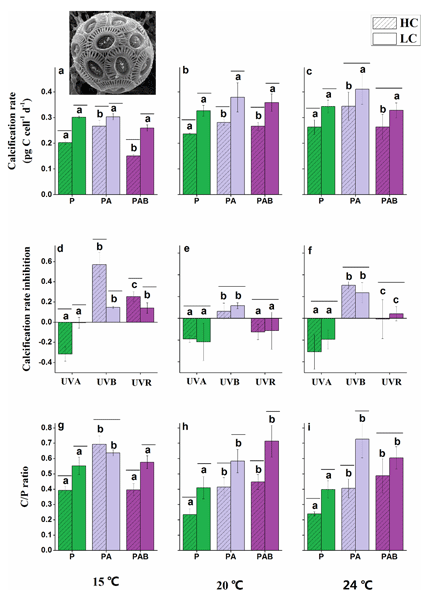 In this study, we found that UVR can counteract the negative effects of the greenhouse treatment on the calcification rate to photosynthesis rate ratio, and may be a key stressor when considering the impacts of future greenhouse conditions on E. huxleyi. 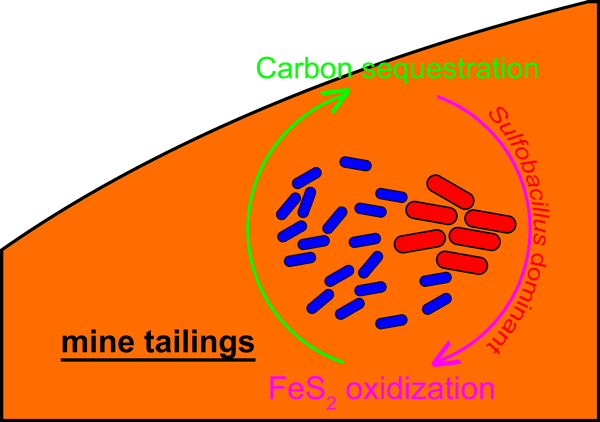 This paper contributes to the study of bacterial carbon sequestration in mine tailings. Previous studies focused on carbonate mineral precipitation, while the role of autotrophs in carbon sequestration has been neglected. Carbon sequestration in two mine tailings treated with FeS2 was analyzed using 13C isotope labeling, pyrosequencing, and DNA SIP to identify carbon fixers. This paper is the first to investigate carbon sequestration by autotrophic groups in mine tailings. This study analyzed microfaunal assemblages in surface sediments from 52 sites in Hong Kong marine waters. 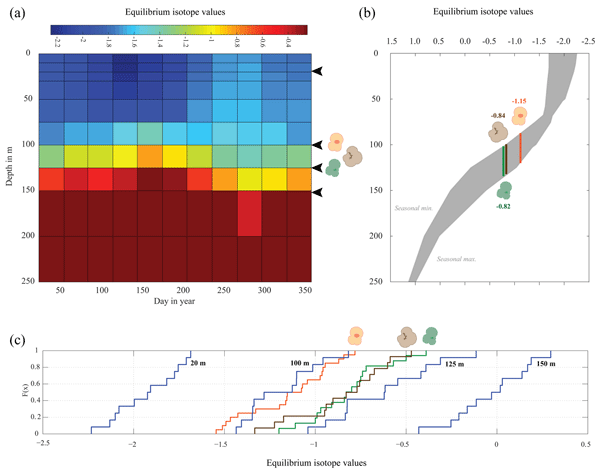 We selected 18 species for linear regression modeling to statistically reveal the relationship between species distribution and environmental factors. These results show environmental preferences of commonly distributed species on Asian coasts, providing a robust baseline for past environmental reconstruction of the broad Asian region using microfossils in sediment cores. High-frequency CO2 measurements are used to quantify the daily and tidal cycles of dissolved carbon in the Bay of Fundy – home to the world's largest tides. The oscillating tidal flows drive a net carbon transport, and these results suggest that previously unaccounted for tidal variation could substantially modulate the coastal ocean's response to global ocean acidification. 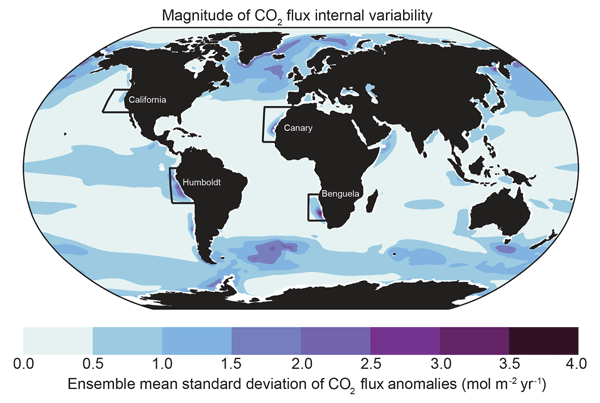 Evaluating the impact of rising atmospheric CO2 on coastal systems requires understanding this short-term variability. In palaeoceanography the shells of single-celled foraminifera are routinely used as proxies to reconstruct the temperature, salinity and circulation of the ocean in the past. Traditionally a number of specimens were pooled for a single stable isotope measurement; however, technical advances now mean that a single shell or chamber of a shell can be measured individually. Three different hypotheses regarding foraminiferal biology and ecology were tested using this approach.